The blogger truths no one talks about. There’s no doubt that being a full-time blogger, or—ahem, a full-time influencer, as the kids are calling it these days, is the weirdest job I’ve ever had. You’re not allowed to bad mouth it or complain, because COME ON GIRL, YOU’VE GOT THE BEST DAMN JOB IN THE WHOLE WIDE WORLD. And people are always hugely skeptical about whether you actually make money, or whether someone else is footing the bill to pay for your hugely 'grammable lifestyle. You realize you’ve gone three days without wearing mascara, pants, or shoes and you start to fear you’re losing every social skill you’ve ever learned. 2. It can be awkward. People will regularly stop you (and your photographer/whoever you’re forcing to stepping into the role of "photographer") to say... 'Do you want me to get a photo of the two of you together?' As though you were both desperate to get a photo hovering around the back streets of BGC for your family photo album, but were too scared to ask. Hey, at least there’s some nice members of the public out there, eh? 4. Sunny days are the devil. THEY ARE THE WORST. They make your photos over-exposed and ugly and hey before you know it you’ve spent 45 minutes looking for a nice wall in the shade. Shade is <3. 5. You drown in paperwork. There’s invoices and new supplier forms. There’s contracts and PO numbers. There’s non-disclosure forms and then there’s five-page forms that don’t even have a name but boy if you wanna get paid, you better fill it out. You’re basically running your own HR department. 6. Instagram takes A LOT of effort. For every photo posted on Instagram there’s about 67 images lurking on your camera roll that didn’t quite make the cut. #SorryNotSorry. 7. You spend a fortune on frickin' photo props. You need a white card and maybe a colored card, but you gotta replace that every time your cat walks across it/you spill coffee on it/you try and flatlay food. Then there’s fresh flowers every week, obvs. Maybe some fancy candles. And oh, about seven notebooks you haven’t actually got around to using yet but hey, they look cute. 8. 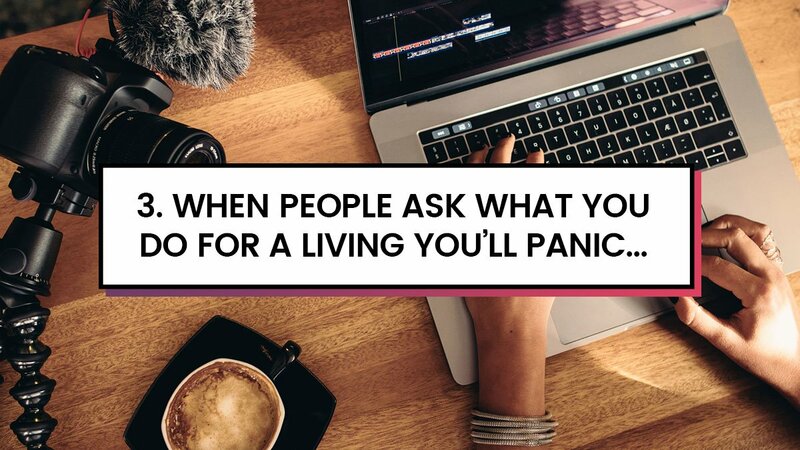 There is no greater blogger fear than the fear of sending off content to a brand you’re working with for approval. Even worse when they don’t email you back for days and you’re like OMG DO YOU HATE ME SO MUCH YOU’RE GOING TO ASK ME TO START AGAIN. Turns out no, just approving your selfie is somewhere right down the bottom of their to-do list. If we don’t, you’ll actually see that our eye make up is busy smudging itself down our face (that, and ain’t nobody got time for a super cute outfit shot when lol, your eyes are closed). 10. Trying to take the perfect flatlay leaves you with some serious lower back ache. All that hovering around, trying to get your eyelash curlers and peonies in the right position ain’t so grand for the ol' posture. WHY WAS HTML NOT A REQUIRED COURSE. No but seriously, or learning how to migrate to a self-hosted website. Or installing widgets. Or editing your blog design. Why is none of it as easy as just like, I dunno, playing The Sims or something? 12. People will ask you how you make money... (sometimes relatives, sometimes ex-colleagues, sometimes complete strangers you only met seven minutes ago). Or if you make money. And how much of it you make. Like OK, sure Sandra, and if you could just email me over your annual salary and a breakdown of every responsibility you have at work, that’d be grand. Between your offline and online life, because damn, if you don’t turn your phone off and actually live without the pressure of "How can I make this content," you might actually spontaneously combust into a cloud of emojis. 14. I once returned a dress after I'd shot it. I was absolutely horrified by the reality of how it looked on me (think Homer Simpson when he's working from home in that floral dress). And, while I have never done it, I've heard of other bloggers who have ordered hundreds of pounds worth of stuff, just so they can film a haul before sending everything back. 15. Blogging is generally a pretty supportive industry. We'll share each other's work, comment on each other's Insta uploads, and vote for each other in awards. But 2017 was the year that we've also become super savvy when it comes to working out who's bought followers and who's gained them in a less than organic way. There's way more faking it 'til they make it than you'd ever have suspected and people haven't been afraid of naming and shaming on social media.